DeVere’s 60-year history of using innovative methods, processes and technology to solve tough cleaning problems is most apparent in its comprehensive commercial laundry product line. The DeVere Boost laundry line includes detergents that utilize surfactants and emulsifiers for superior soil removal, builders that aid detergency to improve soil and stain removal, sanitizers that both whiten and remove stains, sours that neutralize residual alkalinity, softeners that soften and provide anti-static protection, pre-spotters that remove difficult stains, and rewash concentrates that eliminate hard-to-remove soils in the rewash cycle. DeVere even manufactures two-in-one products for added convenience: detergent plus builder and softener plus sour. DeVere utilizes the most recent advances in cleaning technology to also offer its laundry customers sustainable, eco-friendly detergents and whitening agents. DeVere manufactures environmentally safe detergents that will not harm septic systems when used as directed, cold water detergents that reduce energy costs, and oxygen bleaches that whiten and brighten fabrics without chlorine. All DeVere industrial laundry products are ultra-concentrated for economy of use. From powdered detergents for the household washing machine to customized products for multi-programmable, multi-cycle commercial and institutional laundry systems, DeVere has it all. Boost Builder combines surfactants, emulsifiers, and builders to deliver superior soil removal & to lift greasy oily stains from all fabrics. The addition of a whitener keeps whites and colors bright and vivid. Boost Detergent Plus Builder is a concentrated detergent-builder for use in industrial, commercial and institutional applications. Boost Detergent Plus Builder delivers superior soil removal and lifts greasy, oily stains. Boost Laundry Detergent is a concentrated laundry detergent for use in industrial, commercial, and institutional applications. This amazing detergent is safe for almost ALL washable fabrics! It combines surfactants and emulsifiers to provide superior soil removal. Boost Oxygen Bleach is a concentrated non-chlorine bleach for use in commercial laundry equipment. It effectively acts on oxidizable stains and soils. Boost Oxygen Bleach prolongs textile life with proper use and is safe for use on colored fabrics. Boost Powder Laundry Detergent (Boost LD) is a 100% active powder laundry detergent that is powerful but safe to use on all washable fabrics. It may be used in commercial, automatic and conventional washing machines. 3 different products that specialize in cleaning different messes. They can all clean even aged stains. Boost Softener can be used in a wide range of dispersion concentrations, making it perfect for many different uses. Boost Softener has excellent storage stability, so it can be stored without worry, and easy dispersing, which makes for no-fuss use. Boost Sour is a concentrated laundry sour designed to reduce iron discoloration from the water supply while prolonging the life of fabric. Boost Sour neutralizes residual alkalinity from laundry detergents and builders thus preventing dulling iron residues from building up on fabrics. Boost Sour Plus Softener combines softening agents with sour in one product. This product is formulated for use in commercial laundry equipment. Boost Sour Plus Softener does not contain any nonylphenol ethoxylates (NPEs) and therefore is better for the environment. Boost UltraBrite is a laundry detergent powder with organic chlorine. This product is a 100% active power laundry detergent that is powerful and safe to use on all white fabrics. 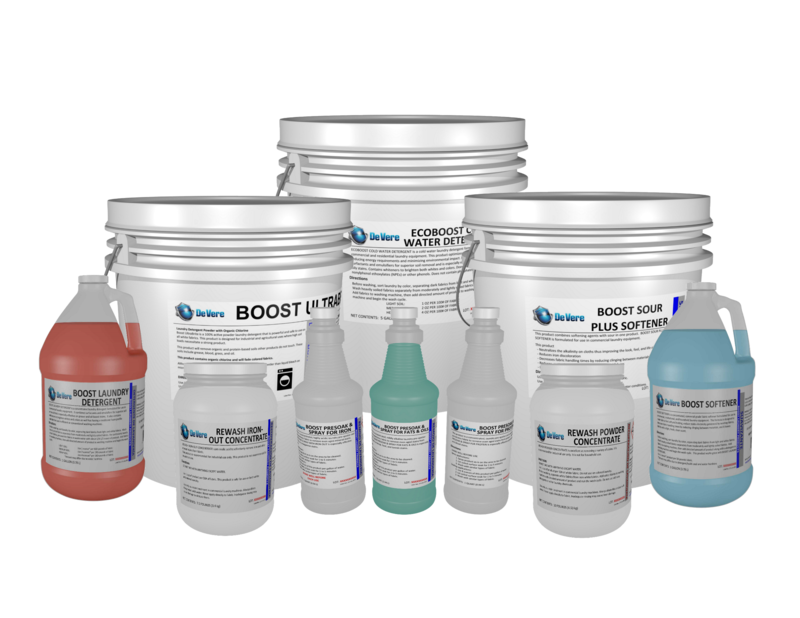 Boost UltraBrite will clean soils including grease, blood, grass, and oil. Eco-Boost Cold Water Detergent is a cold water laundry detergent formulated for use in commercial and residential laundry equipment. Formulated with special ingredients that are designed to work better at lower water temperatures, which will save you money on energy costs! EcoBoost Environmentally Safe Detergent is a concentrated laundry detergent formulated for use in both commercial and residential laundry equipment. Dual action-whitens both whites and colors AND cuts through tough stuck on soils with ease! QDII Sanitizer is a disinfectant, sanitizer, deodorizer, mildew-stat, and virucide – all in one! This product is EPA registered as a food-contact sanitizer as well as a general purpose hard and soft surface sanitizer. QDII Sanitizer is labeled as a laundry sanitizer. Pure Clean rapidly penetrates tough soils naturally pulling them into solution so you can wash them away without added corrosive materials. Pure Clean can even be used for laundry! Rewash Iron-Out Concentrate is a powder that uses oxalic acid to effectively remove iron and other mineral stains from fabric. This product is excellent for removing a variety of stains, but is specially formulated to be tougher on iron stains. Rewash Powder Concentrate is a concentrated reclaim powder for use in commercial laundry equipment. It is excellent at removing a variety of stains. Sanitizer Concentrate is a multi-purpose, EPA registered 12.5% chlorine bleach that can be used on laundry. This product contains the highest concentration of sodium hypochlorite available in an industrial bleach sanitizer. WOW All Purpose Cleaner (WOW) is one of the strongest yet safest detergents made. WOW is excellent for cleaning a wide range of hard surfaces  from walls and woodwork to automobile interiors. It is even an effective laundry presoak. The DeVere Boost laundry line is a family of industrial laundry chemicals for hotels, resorts, water parks, food plants and more. DeVere not only offers industrial laundry detergent and other products in bulk, but also full industrial laundry product and service within Wisconsin.